Inspired by Miami Art Week, we decided we wanted to have an extra creative Foodie experience this month to get our artistic juices flowing. What better place to visit than Canvas? After all, it’s located at the Sagamore Hotel Miami Beach, one of the most renowned art hotels in the country, and right at the heart of so many Art Week events. We were immediately impressed with the casual, chic vibe, flowing from the Sagamore’s gallery into an outdoor poolside patio that’s quintessential South Beach. The sophisticated décor incorporates a black & white color scheme, with silver touches and floor-to-ceiling drapes. Once seated, we were anxious to experience what Executive Chef Michael Smerda had whipped up for the occasion. We’d heard he’s been in the industry for over 22 years, and even hosted radio and cooking shows where he shared his talent and tips with everyone! We were definitely ready to experience his bold, balanced and flavorful works of culinary art for ourselves, with out palates as an enthusiastic canvas. An inventive mix of Pear, Arugula, Marcona Almonds, Goat Cheese, and Truffle Vinaigrette was such a refreshing way to begin our feast! Such a party of flavors and textures; the earthiness and aroma of the Truffle, combined with the bitterness of the Arugula, the tartness of the Goat Cheese, and sweetness of Pear. Overall, a well-balanced combo of flavor that painted a great picture of what was in store. Featuring Sushi-grade tuna, this mix of Crispy Rice, Sesame, Miso Aioli, Eel Sauce, avocado, and Serrano Chiles is layered perfection! There’s just the right amount of spice. 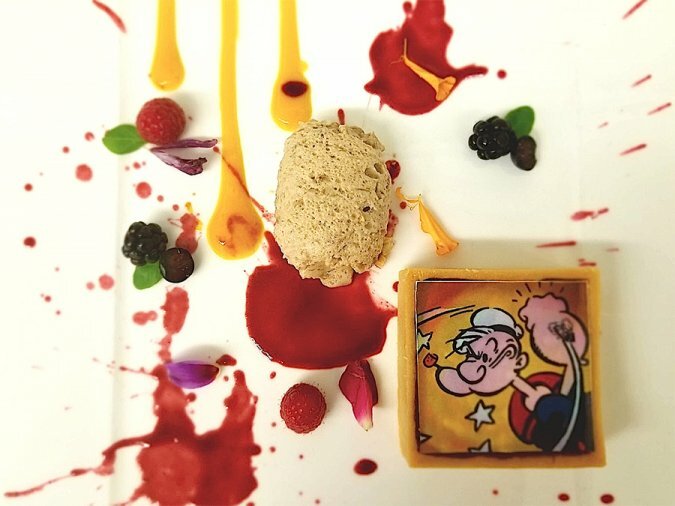 This scrumptious dish was comprised of layers of textures and flavors, and created with so much artistry, that it was almost too beautiful to eat. But how could we resist? Talk about a fiesta in your mouth! This selection includes Spicy Sambal fried Fish, Guacamole, Salsa, Hot Sauce, Cilantro, white Onions, Cotija Cheese and warm Flour Tortillas. Can you say ‘Olé?’ The small slices of fish were deliciously crisp, and every ingredient presented boldly on its own and married together for a sensational mouthwatering bite. Prepared with Red Wine reduction and Velouté sauce, one of the five French “mother sauces” which contributes a velvety, tangy taste, this salmon is the epitome of goodness. The skin side was crispy and the fish flakey and moist. Sensational! Wow! This dessert gets our 3D rating: Decadent. Delightful. Delicious. It features Dark Venezuelan Chocolate, Gianduja Chocolate, Hazelnuts, Banana-Rum Mousse, Mango and Cherry Sauce. Yum! And what makes it even more special? It’s topped with a small replica of a painting adorning the walls. So you get a visual and tasty masterpiece in every bite. Dining at Canvas was definitely an artful experience. Not only are you surrounded by gorgeous artwork and scenic views, the dishes are masterworks, carefully crafted with the precision of a true artist that takes presentation and balance to new levels. Whether you visit during Miami Art Week or any time of the year, you are guaranteed to experience an innovative canvas of class and flavor.